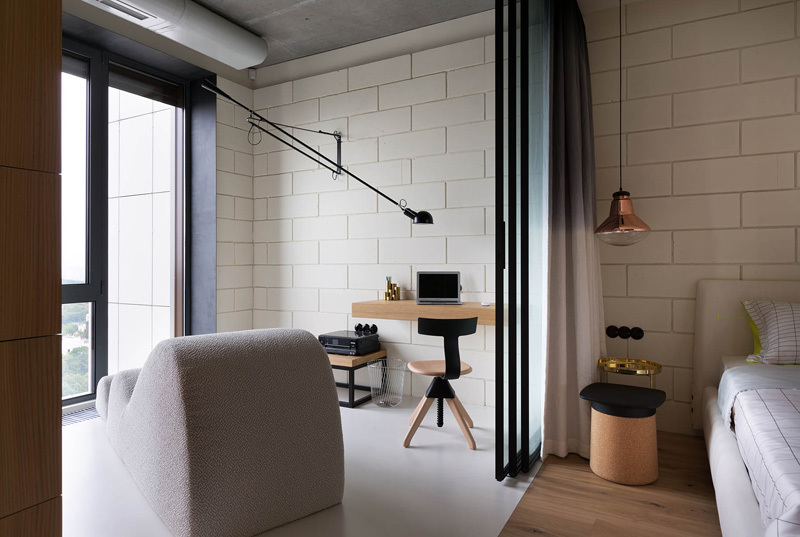 A masculine penthouse apartment has a beautiful view of the city and has a lovely mix of materials in the interior. Many people opt to stay in an apartment especially if what they are looking for is a rental. Well, many people these days are renting spaces because getting a space to own is very expensive. Lucky for you if your space is rent-to-own. Most rentals are apartment or townhouses. But of course, there are also some who buy a unit and then update the look to personalize it. 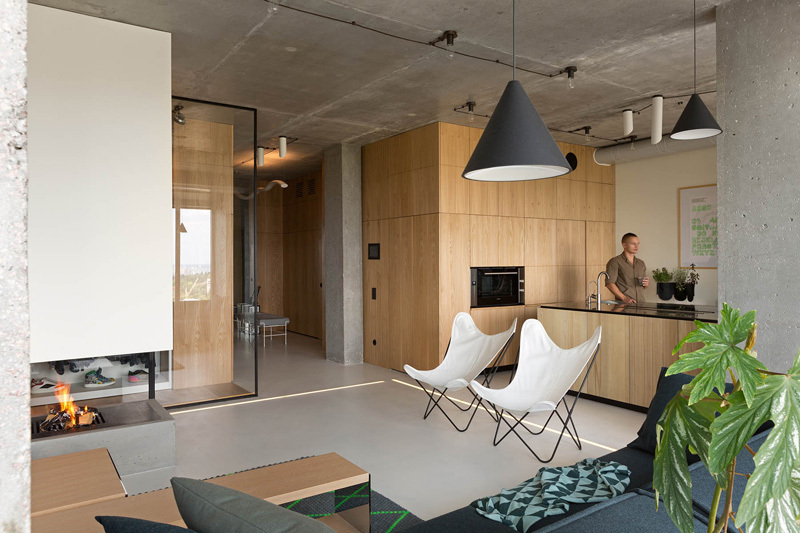 These are the kind of apartments that we usually see being featured here on Home Design Lover. 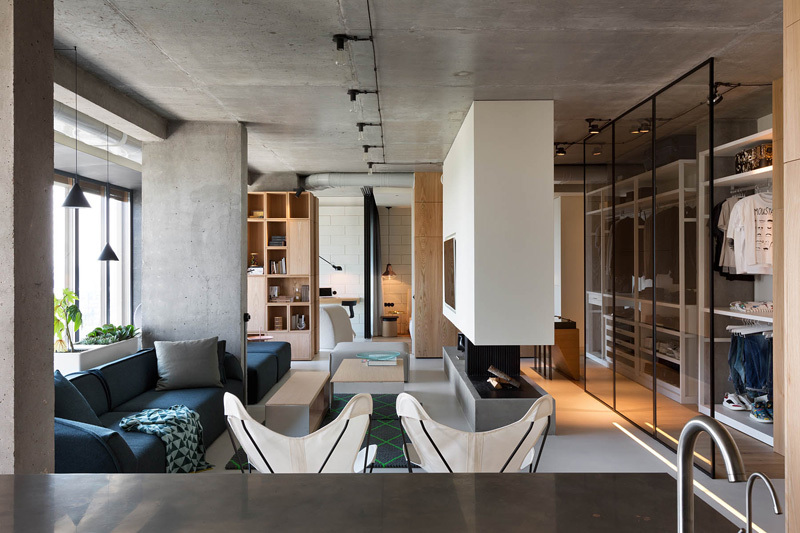 A beautiful penthouse apartment designed by interior designer Olga Akulova will make you want to have a space similar to it. 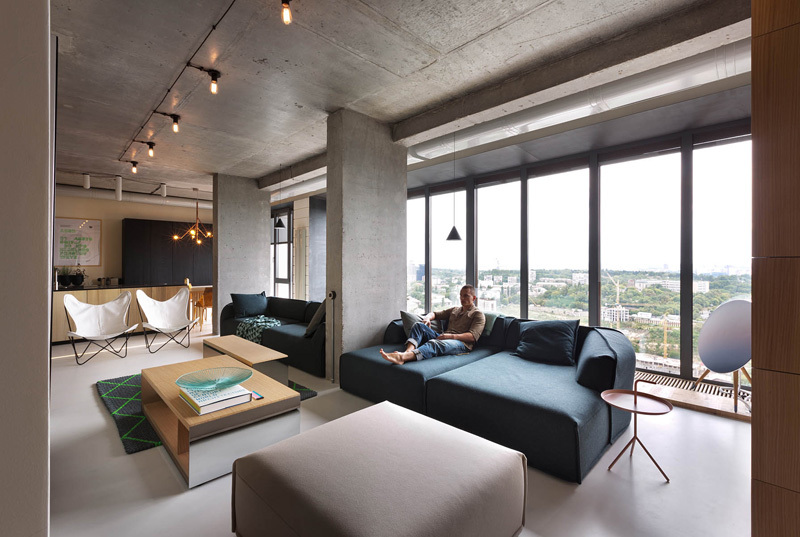 This space is located on the 30th floor of a building in Kiev, Ukraine. It is owned by a young man who wanted a space to relax in especially from his busy day at work. But aside from that, he also wants it to be a place for fun, entertainment and partying with friends. With the design Akulova did for the owner, he would surely do all that and more! The design of the house is a mix of modern and contemporary style with some hints of industrial style too. 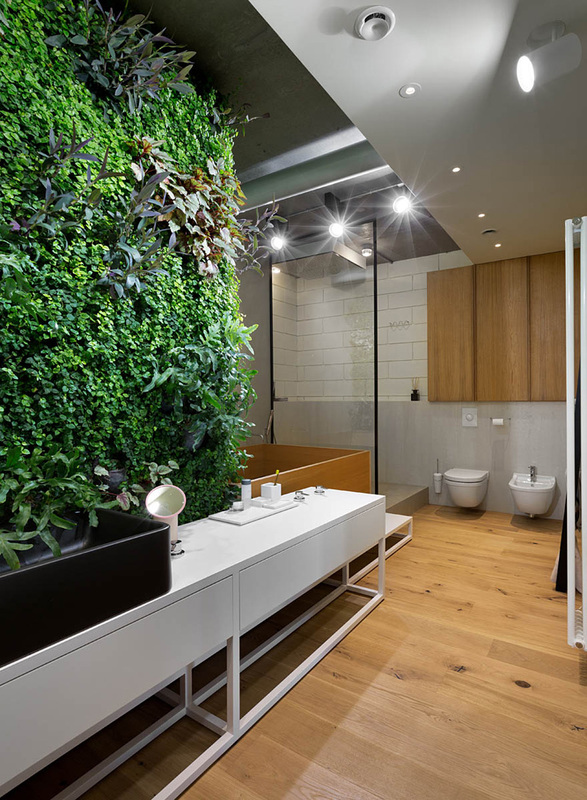 It also has some natural aura with its use of materials and the addition of plants in the interior. Let us take a look at the house below. Unique feature: A modern contemporary penthouse apartment was designed with function and style in mind. It also has hints of industrial style too as well as some natural elements from wood, bricks and even a living wall. 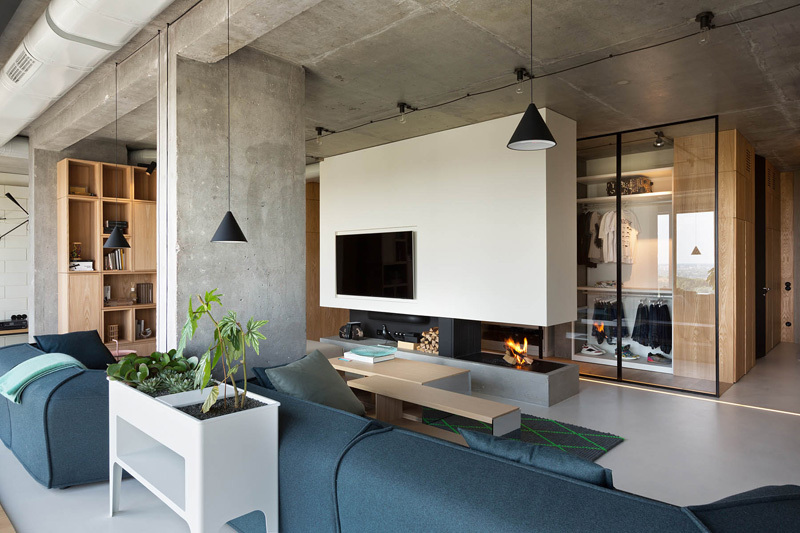 The interior of the house has a beautiful masculine appeal with its use of sleek lines, concrete, and modern colors. Even the furniture has a modern yet distinct design with a mix of straight and curved lines. Tracking lights are used here as well as some industrial looking fixtures to illuminate the space. Floor to ceiling windows allow natural light into the interior of the home that was framed with steel. Wooden cabinets, black pendant lights and that white planter that also doubles as storage space are interesting items in the house. Seen here is a white modern divider that bears the fireplace and a television mounted on it. At its back is the walk-in wardrobe with glass walls. When you look around the interior, you can notice the variety of materials used in it from the ceiling to the white brick walls. The wardrobe here looks like those that we see in department stores because of the glass as well as the design of the cabinets. Just near the living room is the open kitchen with wooden finish. Notice that the kitchen island has a glossy black countertop with wooden surround. Built-in the cabinet is an oven as well as well as other areas for storage too. I honestly find the chairs very cool! Aside from its geometric design, its chrome finish is very lovely too. It sure is a perfect design for a man-owned space. 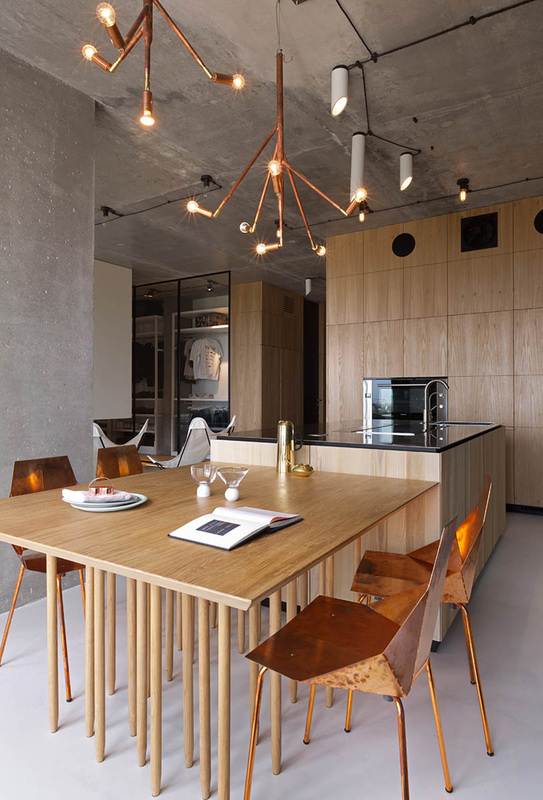 The pendant lights match with the color of the chairs too. And take note of the table’s design with so many legs! Interesting, right? The kitchen island here has an induction stove that is just beside a stainless square kitchen sink with modern faucet. I can say that the space has a nice layout as it is able to make use of every area smartly and practically. 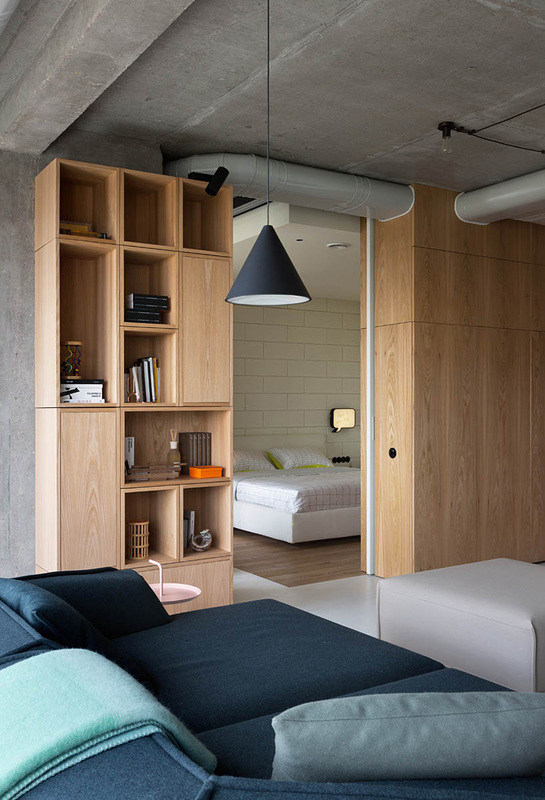 A bedroom can be accessed from the living area. We can see that on the walls there are wooden cabinets which are a good idea to make use of the space. From the bedroom, there is a lounge area as well as a working area. 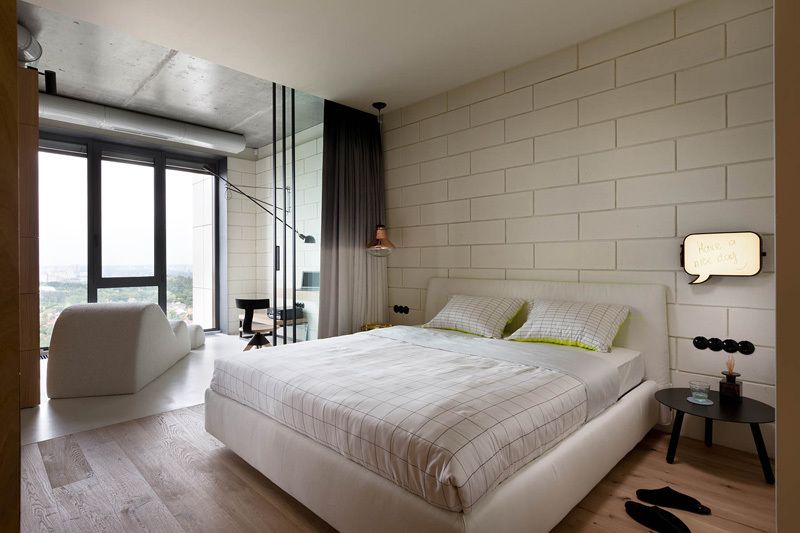 The glass walls from the living room is extended to the bedroom where one can take a look at the view from outside. What I have observed here is the similarity of design from the walls to the grid prints of the pillows and duvet. It is also a good idea to add a green accent to the pillows and other fabrics. A floating desk is a good way to save space. Note a table here on the side of the desk as well as a wooden chair to match. 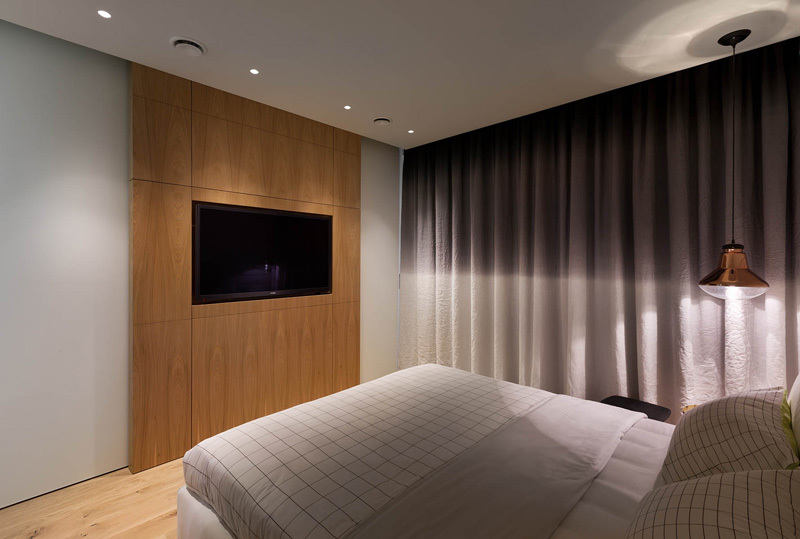 The bedroom can be separated from the working area through a folding glass door and a curtain for added privacy. As you can see, the bedroom is just open to the living area and other areas of the house. But I can tell that there is a sliding door too on the other side that closes the bedroom. And this is how the bedroom looks like when it is already closed- folding glass doors on the other side with curtains and a white sliding door on both sides of the divider that also bears the television- how cool is that? 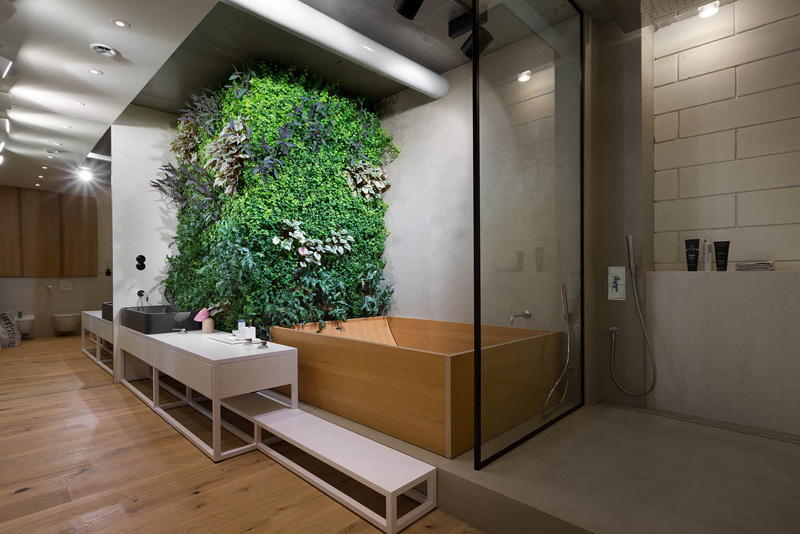 The bathroom has that feature that I like so much- the living wall! I don’t know why but I really like to have a living wall in the house. It’s like nature invades the space when there is a vertical garden like this. 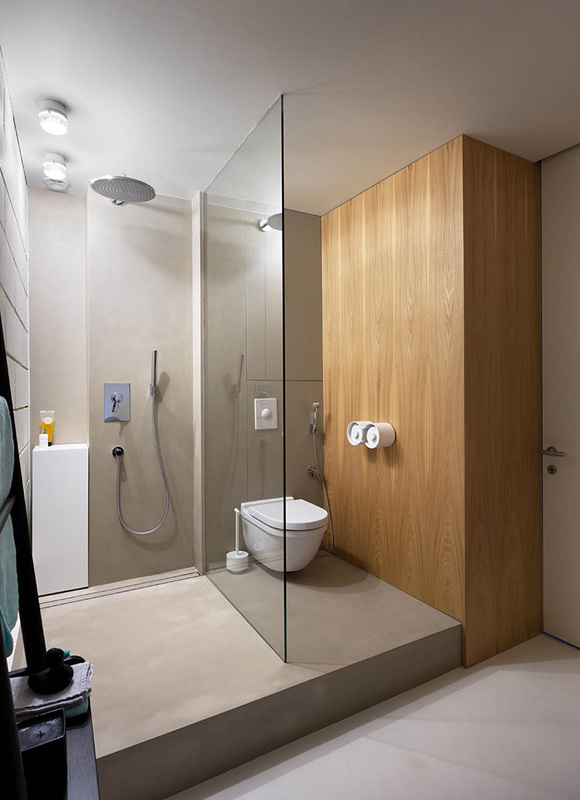 Another look of the bathroom where we can see a wooden bathtub with a curvy design. Beside it is the living wall that I had been digging. 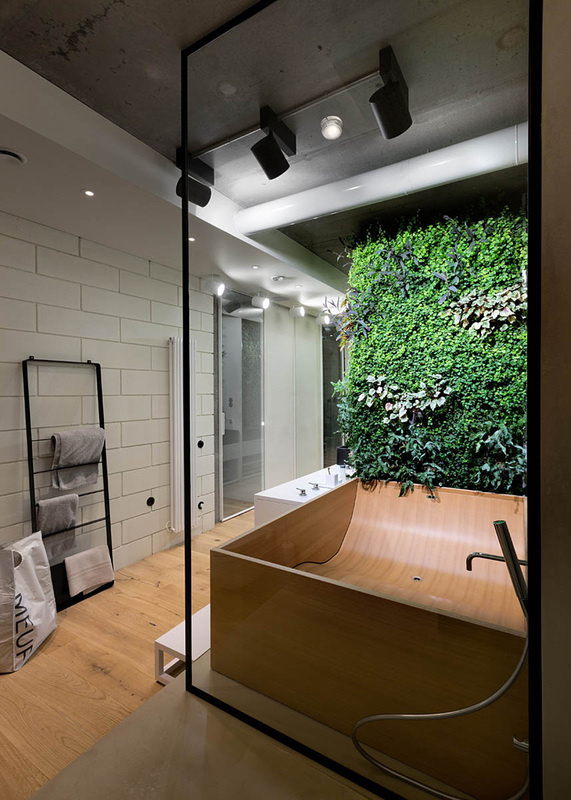 And this is how the entire bathroom looks like with the living wall and bath tub. You can see that the vanity has a unique design as it has a bench under it. And this is the shower are and toilet separated by glass. I like the design of that tissue holder! Interesting mirror, right? 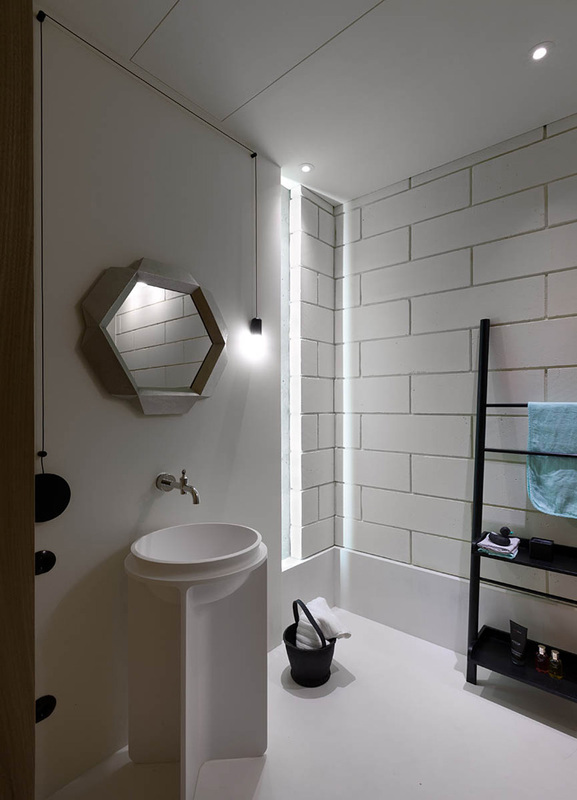 It has a geometric shape that is in contrast with the round pedestal sink. 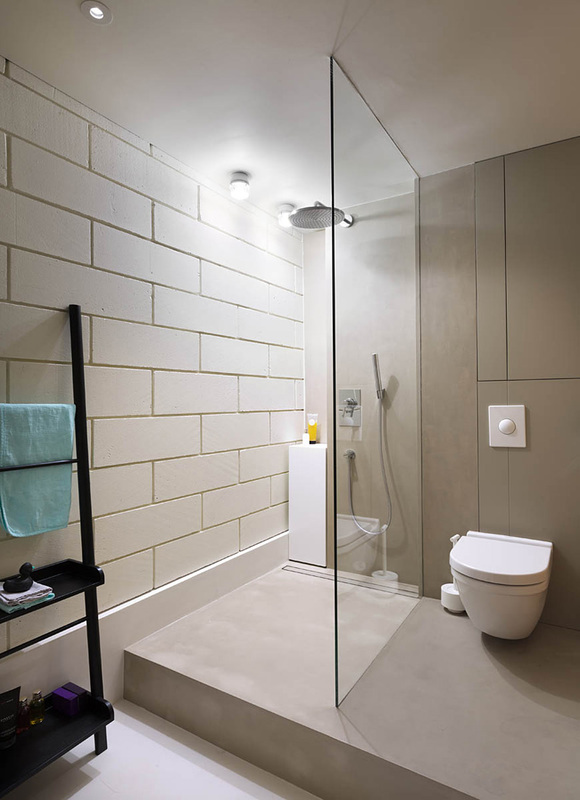 One last look of the bathroom with white brick walls that give it a classic touch. This is just one of the homes we featured with stunning interiors. I know that you have seen many apartments similar to this one but of course, this has a unique look in it. Notice the mix of furniture and the choices of materials for the interior decors and furnishings. Even the architecture is beautiful too. Contemporary interiors like this are common for apartments because its design is neat, functional and is also practical. 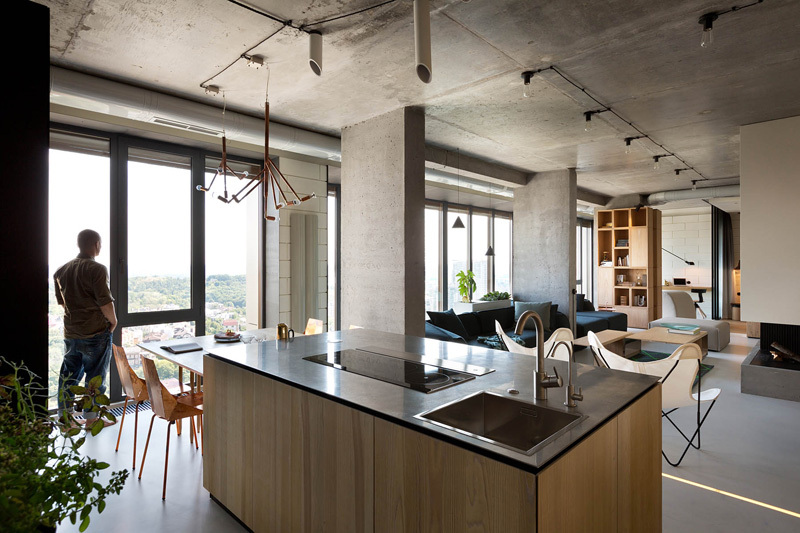 The interior design of this apartment is done by Olga Akulova. Guess that is a familiar name when it comes to beautiful interiors! 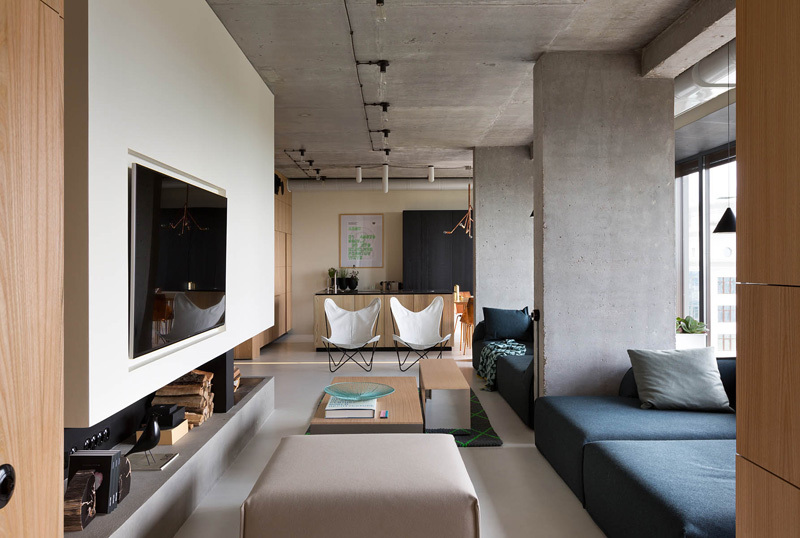 And another thing I like in this interior is the unfinished walls and ceilings, retaining the cement texture and adding an industrial look into it. What can you say about this penthouse apartment?